Born in 1974 in Guilin, China, Li Tianbing studied at the Ecole des Beaux-Arts in Paris, where he formed a unique visual language to express his own cultural origins. 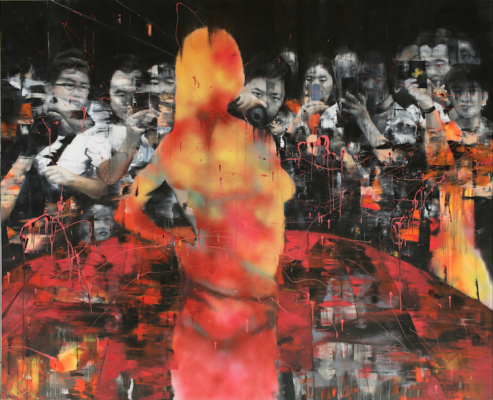 Fusing traditional Chinese techniques with Contemporary Western references, Li does not limit himself to a single style in order to explore the boundaries of the medium. This approach also reflects the artist’s cultural background, rooted in the Eastern philosophy that all things are in a constant state of flux. The ongoing advancement of the “self” thus finds its reflection in Tianbing Li’s ever-changing artistic expression. On a personal level, the paintings offer an intimate portrait of a fantasized childhood, where fiction and fantasy seamlessly merge. Being an only child in China was a condition shared by many children of his generation, a deeply lonely experience with profound psychological effects. Consequently, the artist often sought refuge in his own imagination, inventing games inhabited by fictitious characters. Li‘s poetic childhood portraits reached its most vivid expression in 2006 with the introduction of an imagined brother to his painterly repertoire. Later works depict the artist accompanied by a host of brothers and playmates, which have come to form a complete yet entirely ‘imagined’ family album. On a general outlook, Li’s work articulates the shared loss of a generation who grew up under an authoritative government exercised at its most personal level. Moreover, his compositions interweave the dualities present in China today: East and West, communism and capitalism, ancient culture and modern consumerism. The artist quickly gained international attention exhibiting worldwide.